When considering the economics of immigration, there are three related but distinct issues that should not be confused. First, immigration makes the U.S. economy (GDP) larger. However, by itself a larger economy is not a benefit to native-born Americans. Though the immigrants themselves benefit, there is no body of research indicating that immigration substantially increases the per-capita GDP or income of natives. Second, there is the fiscal impact — taxes paid by immigrants minus the costs they create for government. There is general agreement that less-educated, lower-income immigrants are a net fiscal drain; and more-educated, higher-income immigrants are a net fiscal benefit. Third, there is immigration's effect on the wages and employment opportunities of native-born workers. Basic economic theory predicts that immigration should create a net gain for natives, but to do so it redistributes income from workers in competition with immigrants to workers not in competition and to owners of capital. Theory also predicts that the size of the net gain will be tiny relative to the size of the economy and the size of the redistribution. Because the least educated and poorest Americans are the most likely to be in competition with immigrants, they tend to be the biggest losers from immigration. Putting aside economic theory, the last 13 years have witnessed an extraordinary situation in the U.S. labor market — all of the employment gains have gone to immigrant workers. This is extremely puzzling since the native-born account for about two-thirds of the growth in the working-age population, and should therefore have received roughly two-thirds of the employment growth. Even before the Great Recession, a disproportionate share of employment gains went to immigrants even though natives account for most of the increase in the working-age population. The standard model predicts that the redistribution will be much larger than the tiny economic gain. The native-born workers who lose the most from immigration are those without a high school education, who are a significant share of the working poor. The findings from empirical research that tries to examine what actually happens in response to immigration aligns well with economy theory. By increasing the supply of workers, immigration does reduce the wages for those natives in competition with immigrants. Economists have focused more on the wage impact of immigration. However, some studies have tried to examine the impact of immigration on the employment of natives. Those that find a negative impact generally find that it reduces employment for the young, the less-educated, and minorities. Recent trends in the labor market show that, although natives account for the majority of population growth, most of the net gain in employment has gone to immigrants. The last 13 years have seen very weak employment growth, whether measured by the establishment survey or the household survey. Over the same time period 16 million new immigrants arrived from abroad.6 One can debate the extent to which immigrants displace natives, but the last 13 years make clear that large-scale immigration does not necessarily result in large-scale job growth. A just-released study from the Heritage Foundation found that the average household headed by an illegal immigrant used nearly $14,400 more in services than it paid in taxes, for a total fiscal drain of $55 billion. The Heritage study is absolutely clear that the fiscal costs associated with illegal immigrant households is directly related to their educational attainment. They find that illegal immigrant have on average only 10 years of schooling. Figure 2 at the end of this testimony illustrates the importance of education. For example, it shows that 59 percent of households headed by an immigrant who has not graduated high school access one or more welfare programs, and 70 percent have no federal income tax liability. In contrast, 16 percent of households headed by an immigrant with bachelor's degree access welfare and only 21 percent had no federal income tax liability. Illegal immigrants with little education are a significant fiscal drain, but less-educated immigrants who are legal residents are a much larger fiscal problem because they are eligible for many more programs. For this reason amnesty increases costs in the long run. Heritage's just-released study confirms the finding that amnesty would substantially increase costs over time. In my written testimony I will first briefly discuss the extraordinary developments in the U.S. labor market over the last decade, whereby all or almost all of the net growth in employment went to immigrants. Second, I will discuss the newest research examining the impact on the labor market of immigration. Third I will discuss the fiscal impact of immigration. In the discussion that follows I use the words immigrant and foreign-born synonymously. Following the Census Bureau definition, immigrants or the foreign-born are persons who were not U.S. citizens at birth. The grey bars in Figure 1 at the end of this testimony report the growth in the adult working-age population — 16 to 65 years of age. The vast majority of workers in the United States fall into the 16- to 65-year-old age group so focusing on this population makes sense when considering the population of potential workers. Figure 1 shows that the total working-age population in the United States increased by 25.2 million between the first quarter of 2000 and the first quarter of 2013 — 8.8 million for immigrants and 16.4 million for natives. Thus, natives account for 65 percent of the net increase in the working-age population. Despite natives accounting for most of the growth in the number of potential workers, Figure 1 shows that all of the net gain in employment went to immigrant workers. (An analysis of 18- to 65-year-olds produces very similar results.) The black bars in the figure show the change in the number of 16- to 65-year-olds actually holding a job. The bars show that in 2013 there were 5.3 million more immigrants holding jobs than was the case in 2000, but the same bar for natives holding a job actually shows a loss of 1.3 million. Put a different way, the figure indicates that although the number of potential native-born workers increased by 16.4 million, the number actually working fell by 1.3 million. This means that to the extent there was any increase in the number of people working in the United States in the last 13 years, all of that increase went to immigrants. This development does not prove that immigrants are displacing natives from the labor market. But it is exactly the kind of pattern we would expect to see if that was happening. This situation is also important because the last 13 years have seen the arrival of nearly 16 million new immigrants of all ages, 2000 to 2013.11 Yet Figure 1 makes clear it there has been very little job growth over this time period. This is a clear indication that large-scale immigration does not necessarily result in large-scale job growth. Some may reasonably wonder how things look in different quarters. The most recent data available is the first quarter for 2013. The best first quarter of any year for natives was the first quarter of 2007, right before the recession began. Comparing that quarter to the first quarter of 2000 shows a net increase in the number of natives working of 3.3 million. (The results in Figure 1 mean that all of the employment growth for natives 2000 to 2007 was lost during the Great Recession.) The net gain for immigrants 2000 to 2007 was 4.9 million, meaning that 60 percent of the employment growth still went to the foreign-born. This may not seem so disconcerting, until one considers that natives account for 62 percent of the growth in the 16- to 65-year-old population from 2000 to 2007. So even at the peak of the last expansion in 2007, a disproportionate share of job growth went to immigrants relative to their share of population growth. Net gain from immigration as a share of GDP = - .5 * labor's share of income * wage elasticity * immigrant share of labor force squared. Thus the net gain from immigration is 0.24 percent of GDP. (Expressed as decimal it is .0024.) If GDP is $15 trillion, then the net benefit would be about $35 billion. Three important points emerge from this analysis. First, the net effect of immigration on the existing population is positive overall, thought not for all workers. Second, the benefits are trivial relative to the size of the economy, less than one-quarter of 1 percent of GDP. Third, the benefit is dependent on the size of the wage losses suffered by the existing population of workers. Or put a different way, the bigger the wage loss, the bigger the net benefit. Those who contend that immigration has no impact on the wages of immigrants are also arguing, sometimes without realizing it, that there is no economic benefit from immigration. The same model can be used to estimate the wage losses suffered American workers. Wage loss as a fraction of GDP = - "labor's share of income" * "wage elasticity" * "immigrant share of labor force"* "native-born share of labor force". This is 2.7 percent of GDP, or $405 billion in wage losses suffered by American workers because of immigration. This is not trivial. There is nothing particularly controversial about this estimate and its stems from the same basic economic formula as the one above. Think of it this way: Labor is 70 percent of the economy, which is $15 trillion in total. If the elasticity is .3 and immigrants are 15 percent of the labor force, then wages will decline several percentage points (15 * .3). Thus the total wage loss must run into the hundreds of billions of dollars. If we are to accept the benefit that the model implies from immigration, then we must also accept the wage losses that the model implies. The money that would have gone to workers as wages if there had been no immigration does not vanish into thin air. It is retained by owners of capital as higher profits or passed on to consumers in the form of lower prices. The fact that business owners lobby so hard to keep immigration levels high is an indication that much of the lost wages are likely retained by them. Also, workers who face little or no competition from immigrants will not suffer a wage loss. In fact, demand for their labor may increase and their incomes rise as a result. For example, if you are an attorney or a journalist at an English-language news outlet in the United States you face very little competition from immigrants.16 In fact, immigration may increase your wages as demand for your occupation rises. In contrast, if you are a nanny, maid, bus boy, cook, meat packer, or construction laborer, the negative wage impact is likely to be large because immigration has increased the supply of workers in these sectors quite a bit. But overall the gain to some workers, businesses, and consumers is still slightly larger than the loss suffered by the losers; hence the tiny net benefit reported above. Impact of Immigration Is National, Not Local. Attempts to measure the actual labor market effects of recent immigration empirically have often come to contrary and conflicting conclusions. Studies done in the 1980s and early 1990s, which compared cities with different proportions of immigrants, are now widely criticized because they are based on the assumption that the labor market effects of immigration are confined to only those cities where immigrants reside. The interconnected nature of the nation's economy makes comparisons across cities of labor market outcomes based on the share of the population that is immigrant very difficult. The movement of people, goods, services, and capital defuses the impact of immigration, undermining the cross-city approach. Moreover, the immigrants themselves generally settle in areas of high employment growth making comparisons all the more difficult. Other research has found that immigration adversely impacts the employment of the younger worker. Research by Christopher Smith, an economist at the Federal Reserve, has found that immigration has played a significant role in reducing employment for teenagers.21 My own research supports these findings.22 Other research tends to confirm these finding.23 However, the issue of how immigration impacts the employment opportunities available to natives remains contentious. In the modern American economy, those with relatively little education (immigrant or native) earn modest wages on average, and by design they make modest tax contributions. Because of their relatively low incomes, the less educated, or their dependent children, are often eligible for welfare and other means-tested programs. As a result, the less educated use more in services than they pay in taxes. This is true for less-educated natives, less-educated legal immigrants, and less-educated illegal immigrants. There is simply no question about this basic fact. The relationship between educational attainment and net fiscal impact is the key to understanding the fiscal impact of immigrants, legal or illegal. 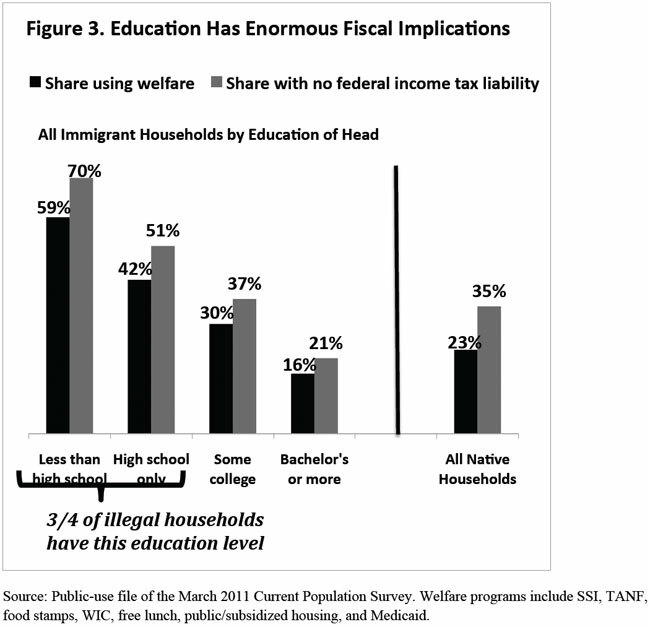 Figure 2 at the end of the report makes clear why less-educated immigrants are a net fiscal drain on average. Households headed by immigrants with a high school education or less have high rates of welfare use and relatively low income tax liability. 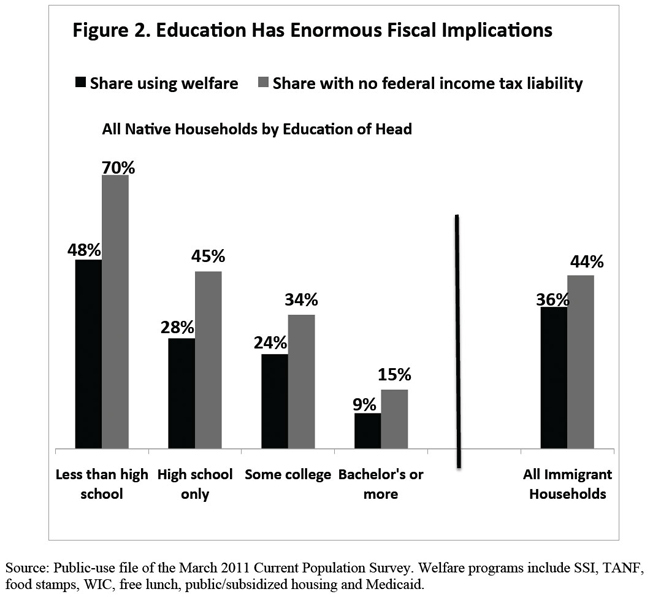 Figure 3 shows that less-educated natives also have high rates of welfare use and low income tax liability. This is an indication that it is education levels, not being an immigrant per se that creates the costs. In the case of illegal immigrants, the vast majority of adults have modest levels of education, averaging only 10 years of schooling. This fact is the primary reason they are a net fiscal drain, not their legal status. It must also be understood that use of welfare and work often go together. Of immigrant-headed households using welfare in 2011, 86 percent had at least one worker during the year. The non-cash welfare system is specifically designed to help low-income workers, especially those with children. There are also a number of other programs in addition to welfare that provide assistance to low-income workers, such as the Earned Income Tax Credit and the cash portion of the Additional Child Tax Credit. The just-released Heritage Foundation study found that households headed by a legal immigrant who had not graduated high school used, on average, $36,993 more in services than they paid in taxes. Households headed by a legal immigrant with only a high school education created a net fiscal deficit of $18,327, those with some college created a deficit of $7,489 and those headed by an immigrant with at least a college education created a fiscal benefit of $24,529.24 This analysis confirms the finding from the NRC study discussed in the bullets and the results in Figures 2 and 3 — education is the key to understanding the fiscal impact of immigrants. There is no better predictor of one's income, tax payments, or use of public services in modern America than one's education level. The vast majority of immigrants come as adults, and it should come as no surprise that the education they bring with them is a key determinant of their net fiscal impact. Advocates of amnesty and allowing in large numbers of less-educated immigrants have three main responses to the above analysis. First they argue that less-educated immigrants are no worse in terms of their net fiscal impact than less-educated natives. Second, they argue that examining households overstates the costs because it includes the U.S.-born children of immigrants. Third, they argue that less-educated immigrants, and immigrants generally, create large economic benefits that offset the fiscal costs they create. As will be discussed below, none of these arguments holds much water. Claim: "Less-Educated Immigrants No Worse than Less-Educated Natives." As I have emphasized in the discussion above, and Figures 1 and 2 below make clear, both less-educated natives and less-educated immigrants are likely to be significant fiscal drain. But this observation is largely irrelevant to the immigration debate. What matters is the actual fiscal impact of immigrants, not whether that impact is similar to similarly educated natives. Immigration is supposed to benefit the country. As a sovereign country we have a right to select well-educated immigrants if we think that makes sense for our country. We also have a right to enforce our laws against illegal immigration. In contrast, less-educated natives are here and it is their birthright to remain. Their low income or high use of welfare is certainly a concern. But common sense suggests that we do not want to add to this problem by ill-conceived immigration policy. Put simply, the fiscal drain created by less-educated natives does not in any way justify allowing into the country less-educated immigrants. Of course, there may be other arguments to allowing in less-educated immigrants. Claim: "Children Should Not Count." Advocates for high immigration often object to doing analysis by households because it includes the U.S.-born children of immigrants. They argue that the costs for education, welfare, and other programs that benefit children should not be counted because these children are not immigrants. (More than 80 percent of children in immigrant households are U.S.-born.) Of course such an argument ignores the fact that the children would not be here but for their parents having been allowed into the country. Further the critics argue that someday the children will grow to adulthood and pay back these costs. This may or may not turn out to be true, but it does not change the very real costs created in the present. The NRC study cited above did individual level analysis, excluding U.S.-born children, and still found a large fiscal drain if the original immigrant arrived without a high school education or with only a high school education. In other words, even without the children, there was still a significant net fiscal drain from less-educated immigrants. Support for a household-level analysis is very common among academics. The National Research Council states that the, "household is the primary unit through which public services are consumed and taxes paid", in their analysis of the fiscal impact of immigrants. In their study of New Jersey, Deborah Garvey and Princeton University professor Thomas Espenshade also used households as the unit of analysis because as they pointed out, "households come closer to approximating a functioning socioeconomic unit of mutual exchange and support." 26 In their 1996 study of immigrant welfare use, Borjas and Hilton examine households.27 The Census Bureau itself has reported welfare use for immigrants and natives by household.28 Household-level analysis makes sense because a child can only be enrolled in Medicaid or free/reduced school lunch if the total income of his or her family or household is below the eligibility threshold. Moreover, many welfare benefits can be consumed by all members of the household such as food purchased with food stamps. On a more practical level, the costs created by children are quite real for taxpayers. Any hoped-for fiscal benefit these children may or may not create in the future is a long way off and unknown, while the current costs are real and must be paid. Finally, it must be pointed out that if the critics are correct — that children should not count — then the same must be true for native-headed households. But if programs and benefits that go to children are excluded, a large share of the federal current budget deficit does not exist. Similarly, if education is not counted then most state and local governments are flush with money. Of course, such a conclusion is total nonsense. Taxpayer money spent welfare and education for children is real and significant. Suggesting that money spend on the children of immigrants or children, generally, should not be counted as a real cost is completely contrary to common sense. This type of argument only obscures the issue and not is unhelpful when thinking about the costs and benefits of immigration. Claim: "Economic Benefits Offset Fiscal Costs." This argument takes several forms, but the idea is that immigration increases the income of natives and this offsets the fiscal costs immigration creates. The National Research Council study mentioned above is the only study of which I am aware that tried to measure both the economic and fiscal impact of immigration. That study concluded that the economic gain to the native-born, which is referred to by economists as the "immigrant surplus", was $1 billion to $10 billion a year in 1996. Above I update those numbers. At the same time the NRC estimated that the net fiscal drain (taxes paid minus services used) from immigrant households was negative $11 billion to $20 billion a year. Thus, there was an economic benefit, but it was smaller than the fiscal drain. While advocacy groups have tried to argue otherwise, there is simply no objective research indicating that immigration creates significant economic gains for natives. Recently some immigration advocates have argued that the Gang of Eight immigration plan will result in significant net gains for public coffers based on the idea of "dynamic scoring" or "dynamic analysis." Chief among them has been Sen. John McCain's former economic advisor, Douglas Holtz-Eakin. Mr. Holtz-Eakin laid out his argument in an opinion piece published by the American Action Forum, which he heads.29 He also recently testified before Congress on this issue. Elsewhere I provide a much longer critique of his arguments.30 Below I touch on some of the main problems with his formulation. The central point of Holtz-Eakin's "dynamic analysis" is to argue that immigration-induced population growth by itself will have a positive, indirect impact on per capita GDP, thereby benefiting public coffers. The few studies he cites to support this argument do not deal with immigration; it is theoretic work suggesting a relationship between a larger population and positive economic outcomes. It is not at all clear whether this work is even relevant to immigration-induced population growth. Probably the biggest weakness of his analysis is that he ignores the actual characteristics of immigrants generally, and illegal immigrants in particular, factors that bear directly on their fiscal impact. This includes relatively high poverty, welfare use, lack of health insurance, and their more modest tax payments. Holtz-Eakin even ignores the research indicating that the education level of immigrants at arrival has direct bearing on their income, tax payments, use of public services, and their resulting net fiscal impact. A larger economy from immigration is not a richer economy, though it is not a poorer one either. It may also be worth noting that to generate these tiny gains immigration has to redistribute income. In the United States, the workers who lose from immigration tend to be the least-educated and poorest workers, who very likely have to use more government services as their income declines. In addition to ignoring the immigration research, Holtz-Eakin also ignores the literature that looks at the impact of population growth on per capita income in developing countries, which would appear to be directly related to his argument. That research generally does not support the idea that by itself population growth increases per capita GDP. A 2009 review of 29 different studies on the impact of population growth on economic development concludes: "Particularly strong is the evidence in support of the increasingly adverse effects of population growth in the post-1980 period. "32 Maybe he feels that this work is not relevant to developed countries like the United States. But he does not say so. Holtz-Eakin's argument is highly speculative. He completely fails to mention the fiscal impact of legalizing illegal immigrants even though this issue is at the center of the immigration reform debate. Immigration makes the U.S. economy larger. However, for the native-born population immigration (legal and illegal) is primarily a redistributive policy; it does not substantially raise the overall income of native-born Americans. As for the fiscal impact of immigration, the education level of the immigrants in question is the key to understanding their fiscal impact. If you take nothing else away from my testimony, it should be remembered that it is simply not possible to fund social programs by bringing in large numbers of immigrants with relatively little education. This is central to the debate on illegal immigration given that such a large share of illegal immigrants have modest levels of education. The fiscal problem created by less-educated immigrants exists even though the vast majority of immigrants, including illegal immigrants, work and did not come to America to get welfare. The realities of the modern American economy coupled with the modern American administrative state make large fiscal costs an unavoidable problem of large scale, less-educated immigration. However, all the available evidence indicates that skilled immigration should be a significant fiscal benefit. 1 George Borjas " target="_blank">"Immigration and the American Worker: A Review of the Academic Literature", Center for Immigration Studies, 2013. 2 See end note 1. 3 See end note 1. 4 See end note 1. 5 See end note 12. 6 See end note 12. 7 The New Americans: Economic, Demographic, and Fiscal Effects of Immigration, National Academy of Sciences Press, 1997. 8 See end note 7. 9 See end note 7. 10 Steven Camarota, "The High Cost of Cheap Labor Illegal Immigration and the Federal Budget", Center for Immigration Studies, 2004. 11 Figures are based on the year of entry question from the public-use file of the January, February, and March Current Population Survey. 12 George Borjas, "Immigration and the American Worker: A Review of the Academic Literature", Center for Immigration Studies, 2013. 13 Barry Edmonston and James Smith, eds., The New Americans: Economic, Demographic, and Fiscal Effects of Immigration, Washington D.C., National Academy Press, 1997. 14 George Borjas, "The Economic Benefits of Immigration", Journal of Economic Perspectives, Vol. 9, No. 2, Spring 1995. 15 "Immigration's Economic Impact", white paper, June 20, 2007. 16 Steven Camarota and Karen Jensenius, "Jobs Americans Won't Do? A Detailed Look at Immigrant Employment by Occupation", Center for Immigration Studies, August 2009. 17 Steven Camarota and Karen Zeigler, "Are There Really Jobs Americans Won't Do? A detailed look at immigrant and native employment across occupations", Center for Immigration Studies, 2013. 18 See this study for a good summary of the academic wage literature: George Borjas, "Immigration and the American Worker: A Review of the Academic Literature", Center for Immigration Studies, 2013. 19 Kevin McCarthy and George Vernez, Immigration in a Changing Economy, California's Experience, Rand Corporation, 1997. 20 Borjas, George J., Jeffrey Grogger, and Gordon H. Hanson. 2010. "Immigration and the economic status of black men" Economica. 77: 255-282. Borjas et. al. found a 10 percent increase in the supply of less educated immigrant workers, controlling for age reduced the fraction of native-born blacks in that group holding a job by 5.1 percentage points. See also "Latino Employment and Black Violence: The Unintended Consequence of U.S. Immigration Policy Edward S. Shihadeh, Raymond E. Barranco, Social Forces, Volume 88, Number 3, March 2010, pp. 1393-1420 (Article). Published by Oxford University Press. Shihadeth et. al. find that latino immigration increases urban black violence. They conclude that, "Latino immigration raises black violence by first increasing black unemployment." An earlier study by Augustine Kposowa also that immigration had a negative impact on black employment. See Kposowa "The Impact of Immigration on Unemployment and Earnings Among Racial Minorities in the United States." 1995, Racial and Ethnic Studies, Vol. 18. 21 Christopher L. Smith, "The Impact of Low-Skilled Immigration on the Youth Labor Market", Journal of Labor Economics, Vol. 30, No. 1 pp. 55-89, 2012. 23 Andrew Sum, Paul Harrington, and Ishwar Khatiwada, "The Impact of New Immigrants on Young Native-Born Workers, 2000-2005", Center for Immigration Studies, 2006. 24 Robert Rector and Jason Richwine, http://thf_media.s3.amazonaws.com/2013/pdf/sr133.pdf " target="_blank">"The Fiscal Cost of Unlawful Immigrants and Amnesty to the U.S. Taxpayer", Heritage Foundation, 2013. 25 Julian L. Simon, "Immigrants, Taxes, and Welfare in the United States", Population and Development Review, Vol. 10, No. 1 (Mar., 1984), pp. 55-69. 26 "State and Local Fiscal Impacts of New Jersey", in Keys to Successful Immigration: Implications of the New Jersey Experience, Thomas J. Espenshade, ed., Washington, DC: Urban Institute Press, p. 143. 27 George J. Borjas and Lynette Hilton, "Immigration and the Welfare State: Immigrant Participation in Means-Tested Entitlement Programs", Quarterly Journal of Economics, May 1996. 28 The Census Bureau reports welfare use by household based on the nativity of the household head. See, for example, Figures 20-1, 20-2, and 21-3 in "Profile of the Foreign-Born Population: 2000", pp. 23-206, U.S. Census Bureau, December 2001. 29 Douglas Holtz-Eakin, "Immigration Reform, Economic Growth, and the Fiscal Challenge", April 2013. 30 Steven A Camarota, "Dynamic Scoring of Immigration? A Critique of Douglas Holtz-Eakin's Analysis", Center for Immigration Studies, 2013. 31 See "Immigration and the American Worker A Review of the Academic Literature", Center for Immigration Studies, 2013. 32 Derek D. Headey and Andrew Hodge, "The Effect of Population Growth on Economic Growth: A Meta-Regression Analysis of the Macroeconomic Literature," Population and Development Review, Vol. 35, No. 2, 2009.